Guided Tours and Excursions - Caspar David Friedrich | Since 1774. In Greifswald. Caspar David Friedrich is Greifswald’s most famous son. The son of a soap and candle maker was born on 5 September 1774 in Greifswald. He lived in Greifswald until he was 20 years old and maintained very close links to the city and the region until his death. Many original locations that played an important role in his life and work can still be visited in and around Greifswald today. 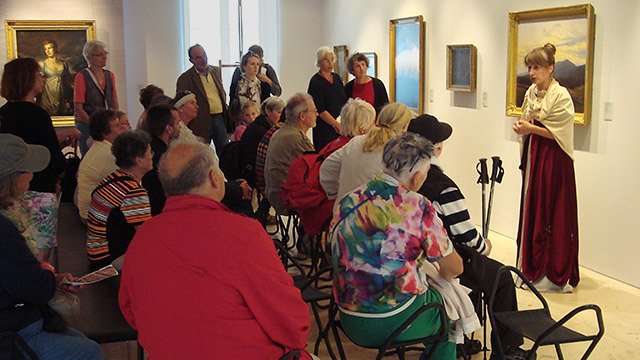 There are a variety of tours that provide fascinating insights into Friedrich’s time and work. The guided bike tour (bring your own bike!) comprises all stops of the Caspar David Friedrich Trail. It starts at Friedrich’s place of birth, which is now the Caspar David Friedrich Centre, and stops at the Market Square, Greifswald Harbour as well as in the fishing village of Wieck. The tour ends at the ruins of Eldena Abbey, one of the painter’s most important motifs. Information on bike rentals can be provided on request. This guided walk through Greifswald’s historic city centre starts at the Caspar David Friedrich Centre, the house where Caspar David Friedrich was born. The walk passes St. Nicholas’ Cathedral and the main building of the University of Greifswald – two important places in the painter’s life. Other stops include St. Jacob’s Church, the City Harbour and the market square, all of which featured in Friedrich’s paintings and drawings. In search of Caspar David Friedrich’s motifs we will explore Greifswald’s historic city centre. You will have the opportunity to draw some of the sites that inspired the painter, e. g. St. Jacob’s Church, the ‘Bleiche’, or the City Harbour. No previous knowledge required. Drawing material is provided. Please bring your own pillow and camping chair. The guided walk starts with a tour of the Caspar David Friedrich Centre, the artist’s birthplace, before visiting two of the stops on the Caspar David Friedrich Trail, St. Nicholas’ Cathedral and the market square. The tour ends with a visit to the Pomeranian State Museum, where you will have the opportunity to admire some of the artist’s original paintings. In 1818, Friedrich and his wife spent their honeymoon in Greifswald as well as on the Isle of Rügen. During their stay in Greifswald, Friedrich painted his famous watercolour of the market square with members of his family in the foreground. From this time on, female figures pictured from behind appear more frequently in his drawings and oil paintings. The guided tour begins at the Caspar David Friedrich Centre, passes along the ramparts, past the city harbour and ends at the market square. The tour of the Caspar David Friedrich Centre, the house where the artist was born, provides information on the life and work of the world-famous painter. The family history and the history of the trades of soap boiling and candle-making, practised by Friedrich Senior, are presented in authentically furnished rooms. In addition, the Caspar David Friedrich-Gallery shows works of contemporary artists, whose focus is on topics related to the Romantic era. The tour can be combined with the making of a candle or soap, or a quiz for children attending grades one to eight. There is an additional cost of €0.50 per person for a candle or €1.50 per person for soap. This tour of the Centre concentrates on Caspar David Friedrich’s travels to the Isle of Rügen. Who inspired him to discover and paint the island? Which routes did he take? What motifs were important to him? Which paintings were modelled on his Rügen sketches and drawings? This guided bicycle tour follows the Caspar David Friedrich Trail from the Caspar David Friedrich Centre, past the harbour and along the towpath to Wieck and the ruins of Eldena Abbey. Along the way, you can discover many of the motifs that Friedrich used in his paintings, ranging from sketches of numerous ships, the view of Greifswald from the river Ryck, to the many different versions of one of Friedrich’s most important motif, the ruins of Eldena Abbey. Information on bike rental in Greifswald can be provided on request. Caspar David Friedrich, Vincent van Gogh & Co.
Find out interesting facts about great master painters, their technical subtleties and fascinating motifs. We will tell you why the dogs in Caspar David Friedrich’s paintings have six ears, how Max Liebermann painted sunspots and who brought van Gogh to Pomerania.